Serving Pacific Beach, Mission Beach, Clairemont, La Jolla and San Diego tourists since 2003. With over 35 years of athletics, 15 years as a full-time fitness professional and certified personal trainer, Coach Dave Nielsen has worked with countless men and women in the pursuit of fitness, goal focus & attainment, personal betterment, self defense, sports enhancement and of course competition goals. Just text “Free PT Consultation” to 619.838.4883 and we’ll set up a time that works for you to come in and discuss your goals. Personal Training is available at any pre-determined time. Workout at 6am, 3pm, 9 pm or ANY time in between! We understand that schedules can be hectic and we try to accommodate your fitness training to the best of our abilities. Dave Nielsen and his associated trainers are Experienced and Professional Fitness Trainers using the following tools to help you reach your personal health and fitness goals FAST! QUESTIONS? Text “Free PT Consultation” to 619-838-4883 now to set up your Free Consultation. 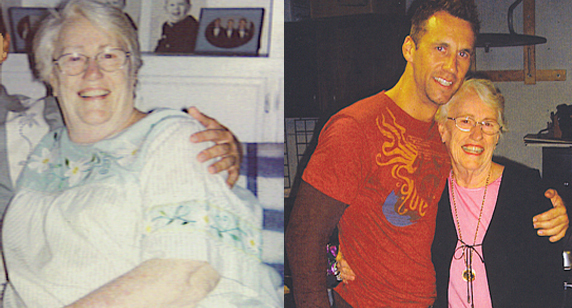 April Powers a 66 year old client lost 80 lbs in 8 months training with American Boxing Coach Dave (pictured together below at her birthday party in 2002). Click here to read some more of our testimonials and watch our video reviews. Talk with Master Fitness Trainer Coach Dave Nielsen Today!